Princeton. Good Friday, 1999. On the eve of graduation, two friends are a hairsbreadth from solving the mysteries of the Hypnerotomachia Poliphili, a Renaissance text that has baffled scholars for centuries. Famous for its hypnotic power over those who study it, the five-hundred-year-old Hypnerotomachia may finally reveal its secrets—to Tom Sullivan, whose father was obsessed with the book, and Paul Harris, whose future depends on it. As the deadline looms, research has stalled—until a vital clue is unearthed: a long-lost diary that may prove to be the key to deciphering the ancient text. But when a longtime student of the book is murdered just hours later, a chilling cycle of deaths and revelations begins—one that will force Tom and Paul into a fiery drama, spun from a book whose power and meaning have long been misunderstood. 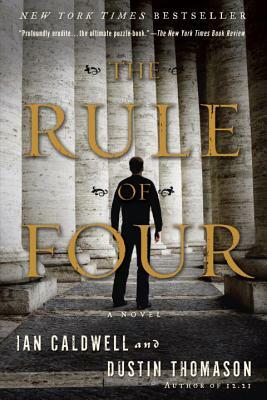 Ian Caldwell is the author of a forthcoming novel set inside the Vatican. He graduated Phi Beta Kappa in European history from Princeton University, and lives near Washington, D.C., with his wife and three sons. Dustin Thomason is also the author of 12.21. He graduated from Harvard College and received his M.D. from Columbia University. Thomason has written and produced several television series, including Lie to Me. He lives in Venice Beach, California. The two have been best friends since they were eight years old.